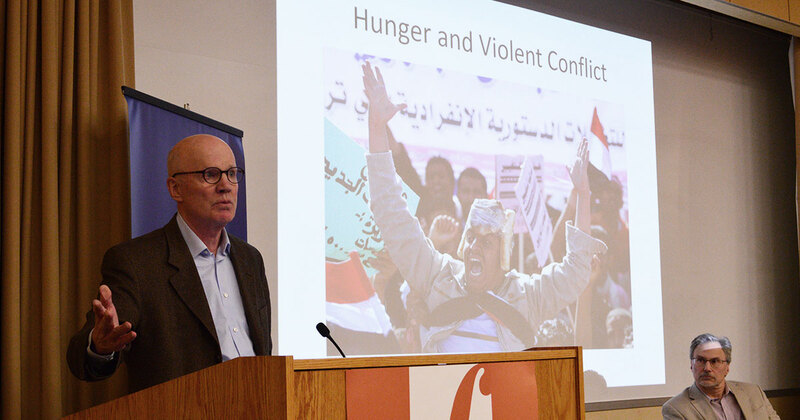 The Fletcher Culinary Diplomacy and Food Policy Group, the Tufts Culinary Society, and the Fares Center for Eastern Mediterranean Studies held the Fletcher Food Symposium “Food & Conflict” on Friday, 20 April. The support from the Tuft’s Institute for Global Leadership helped contribute to a successful symposium and stimulating set of panel discussions. Tuft’s Institute for Global Leadership helped contribute to a successful symposium and stimulating set of panel discussions. For the second year in a row, the Fletcher Food Symposium provided a forum to deepen Fletcher's approach to food studies, contextualized through a conversation on culinary diplomacy and tailored to Fletcher disciplines and specializations: food boundaries and identity shaped by security, human security, conflict resolution, and peacebuilding. This year’s symposium enhanced the discussion on food’s connection to conflict, peacebuilding, and cultural identity. Our panels discussed why and how food can: i) be drivers in situations of conflict as well as be central to survival and community resilience within zones of conflict; ii) catalyze peace and build community across borders in the ever-globalizing world; and iii) promote cultural identity through refugee, migrant, and diaspora communities. The symposium kicked off with a documentary film screening of “Haven’t We Shared Much Salt and Bread Together” followed by Q&A with the film producers, Ihsan Karayazi and Armine Avetisyan. The documentary highlights a culinary diplomacy program that connects women from the Armenian town of Gyumri and the Turkish province of Kars. They took turns hosting each other in their respective countries and sharing recipes. The documentary demonstrated the power of food in helping to break down barriers and stereotypes of ‘the other’ as the groups of women discovered what they shared – including similar food recipes – was more meaningful than their differences. We were lucky enough to bring Sam Chapple-Sokol back to campus. Sam, Fletcher Class of 2012, is a culinary diplomacy expert. As a student, Sam wrote “Breaking Bread to Win Hearts and Minds” for a course with Fletcher’s Prof. Alan Henrikson. During this panel, Sam explained the soft power of food at all levels of diplomacy, including Track 1 (Government-to-Government), Track 2 (Unofficial Government-to-Citizens), and Track 3 (People-to-People). When a skeptic questioned whether all cuisines – specifically the Dutch cuisine - are unique and tasty enough to be used in diplomatic efforts, Sam assured everyone that yes, all cultures and countries have something delicious to offer. The first panel focused predominantly on food’s positive contribution to international affairs, though Sam led us into our next panel noting that culinary diplomacy is not all “hummus kumbaya”. While it can be a tool for good, it’s not a cure-all and can be used for harm. Our panelists, Emma Beals, an award winning investigative journalist, and Jose Ciro Martinez, a University of Cambridge Junior Research Fellow, discussed the political power of food as seen over the course of the war in Syria. They discussed how Syrian President Assad’s regime allowed access to food only in certain areas, while denying it in other areas. As a result, food aid became a political weapon to weaken enemies. Ciro Martinez highlighted the role of the United Nations and international NGOs, arguing that their desire to remain neutral is not practical. The act of providing food aid and relief is politicized by default when providing food in areas controlled by the current regime. Panel 3: Neither Bread Nor Freedom | What Drives Revolts? Prof. Ellen Messer, from the Friedman School of Nutrition Science and Policy (Tufts University), and Prof. Robert Paarlberg, from the Harvard Kennedy School, engaged in a debate about whether food drives conflict and revolt or exacerbates other underlying conflicts. Prof. Messer sited her former research which coined the term “food wars”. This term captures the connection between hunger as a weapon of war and hunger as an effect of war in the developing world. Prof. Paarlberg argued that some of the world’s most food-insecure places (e.g., South and Southeastern Asia) are not in conflict. Prof. Paarlberg stated that uprisings, like the Arab Spring, were not due to high food prices or hunger as bread prices were, in fact, heavily subsidized. Ihsan Karayazi and Armine Avetisyan kicked off this panel revisiting the Turkish-Armenian culinary diplomacy program. They considered the possibility of scaling up such programs and discussed the potential impact these programs may have on creating greater cultural change. Gonca Sönmez-Poole (Fletcher c/o 1999) then described her work in the Boston area. She works to find opportunities for the Turkish and Armenian diaspora to come together and build bridges, often over the dinner table or tea. Another recent alum, Anna Ackerman, Class of 2017, highlighted her recent project, “World to Table.” The project started in Augusta, Maine and will be rolling out to Portland, Maine this summer. The aim is to help “New Mainers” – that is, recently resettled refugees and migrants – integrate and meet the local Maine community over community dinners. The panel was rounded out by a different sort of food and integration angle, with Alex Galimberti from Oxfam America highlighting the role that immigrants play in the US food system (e.g., in restaurant kitchens, in the fields) and in particular, in the poultry sector. These workers are critical in ensuring that food reaches our plates but are often overlooked, poorly treated, and deprived of many human rights. Alex called for better integration of these food workers to who we owe so many of our meals. To wrap up the day, we welcomed local area chefs, food writers, and culinary historians to discuss how food is a marker of cultural identity. We discussed how food can be preserved in the diaspora, particularly within cities and culinary hubs which have been destroyed by war (i.e., Mosul and Aleppo). Our speakers discussed a wide variety of cuisines, cultures, and countries – illustrating the important role that food plays. Many people agreed that it is common to forego traditional dress and language upon moving to a new region or country for the sake of assimilation. Food, however, is preserved and recipes, tastes, and flavors are passed down from generation to generation. We are so grateful to the panelists, moderators, funders, and other generous supporters who made this day possible. The Fletcher Culinary Diplomacy and Food Policy Group, the Tufts Culinary Society, and the Fares Center for Eastern Mediterranean Studies are exploring opportunities for speaker series and symposium in the AY 2018-2019 to further define the Fletcher approach to food.